Floss McFarland, Dublin’s hottest but hapless female detective is going to need every skill she has (and some she doesn’t) to crack her latest case. Ruthless human traffickers will test Floss, loyal sidekick Penny and their colourful collective of quirky characters to their very core. 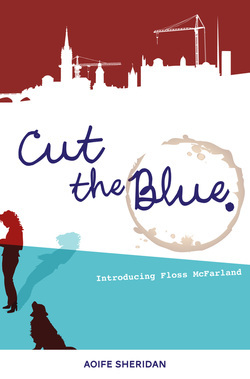 When Floss McFarland ditches her secure and lucrative actuarial job to set up Cut the Blue Investigations, her friends and family thing she’s lost the plot. And two years into a less than glamorous career chasing corporate fraudsters, cheating husbands and wayward pets, she’s starting to see their point. Gone are the glamour days of unlimited funds and flippant spending. Floss now lives hand-to-mouth, surviving on any low level job that comes her way. Her dreams of headline grabbing cases and national recognition long lost, these days her only cases tend to involve bad debts. But Floss is determined to turn CTB’s luck around and things are finally starting to look up …An old insider trading job, lost a year ago, resurfaces out of the blue. Complete with high profile client, corporate sabotage and the promise of a large cheque, it has all the attributes of the perfect case. But like Dublin buses, good gigs come in twos and a second more challenging job falls in her lap. A young Russian girl approaches Floss & Penny with a desperate plea for help. Her best friend Anna is missing, feared kidnapped or worse. Every sensible impulse should have Ireland’s answer to Cagney and Lacey pass the case onto more experienced hands, but Anna’s heart-breaking story leaves them captivated and powerless to resist. Pausing only for cake, Floss and Penny throw themselves head first into this second case. Fired up and determined not to fail, they soon uncover a sinister human trafficking ring at the heart of Dublin’s underbelly. More ruthless and vicious than any white-collar weasel they’ve faced to date, the girls reluctantly admit to being in over their heads. Enter the reinforcements …From stage left, the mysterious Tash, Lithuania’s version of Lara Croft. And stage right? Seasoned and sizzling Milo McCarthy, ex-special branch, turned Private Eye. Struggling and out of her depth, Floss needs a mind-melting love triangle like she needs a full bodied perm, but that’s exactly what she’s got. Will she pick Tash and dabble in ‘the dark side’? Or will she fall for Milo’s bad-boy, Dublin charm? But most important of all, will she find Anna before it’s too late?